Directed by Giulio Paradisi, 1979’s The Visitor stars legendary Hollywood director/actor John Huston (The Maltese Falcon; Treasure Of The Sierra Madre) as an intergalactic warrior who joins a cosmic Christ figure (Franco Nero) in battle against a demonic 8-year-old girl and her pet hawk. 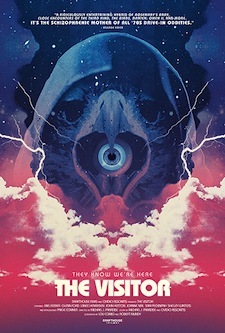 Restored and presented uncut for the first time ever in the U.S. by Drafthouse Films, The Visitor is a ’70s psychedelic mindwarp complete with vicious bird attacks, multi-dimensional warfare and pre-adolescent profanity. Somewhere between Hell, the darkest reaches of the universe, and Atlanta, GA, the fate of the cosmos hangs in the balance. The Visitor fuses elements of The Omen, Close Encounters Of The Third Kind, The Birds, Rosemary’s Baby, The Fury, and even Star Wars, creating the most ambitious, insane film you’ve ever seen. Basically, Space Jesus sends an emissary named Jerzy (Huston) to Earth to capture Katy (Paige Conner), a little girl with superhuman abilities. Meanwhile, evil space aliens are trying to get Katy’s mother (Joanne Nail) pregnant so that she will give birth to the antichrist, another super-kid they can use to destroy the human race.